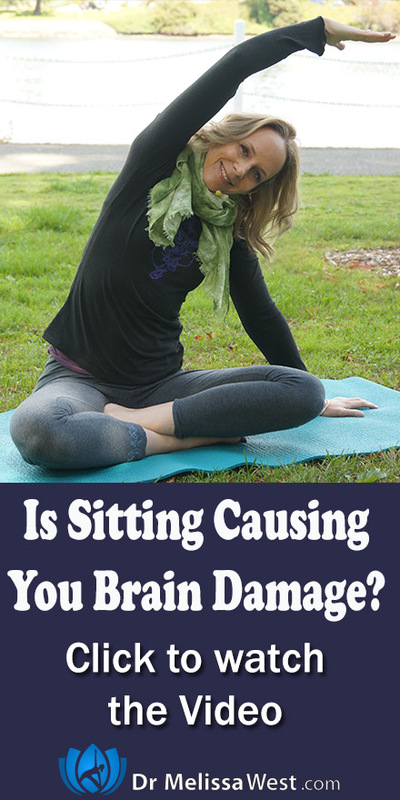 Is Sitting Causing You Brain Damage? Did you know that your brain function starts to slow when your body is not getting movement? When you are sedentary, your brain gets less fresh blood and oxygen which is needed to trigger the release of brain and mood enhancing chemicals. Taking short movement breaks can start to restore the flow of fresh blood and oxygen to your brain. Yoga poses like cat pose are super beneficial and in fact you can do it right from your chair. Your spine houses your nervous system. When you take the time to move your spine through flexion, extension, rotation and side bending, even in your chair, it will improve the sending and receiving of messages through your nervous system to and from your brain. It is through your spinal cord and its branching nerves that your brain influences the rest of your body, controlling movement and organ function and thus your organ function will also be enhanced along with enriched coordination and proprioception.